To witness the full majestic sight of the Giant Ground Sloth in all it’s glory, it is best to visit at twilight. For around half an hour after the museum doors open, and then again for around half an hour just before they close, there are few visitors to distract you. Walk along the grand corridor, past exquisite remains of reptiles that once thrashed around in the warm Jurassic seas, which now line the walls watching you form their rocky entombment. At the end of the corridor, standing handsomely, proudly in the corner, is the Giant Ground Sloth; the truly magnificent Megatherium americanum. Almost a decade ago, I volunteered at the Natural History Museum, London in the fossil mammals department. Each morning, often before museum visitors were pouring in, I would admire this massive beast; its robust legs, its massive rib cage that must have once housed an enormous gut, the giant claws, and that cute looking head. Then, I would silently slink through a secret door to carry out my work with some awesome Ice Age fossils. Megatherium was a true giant. One of the largest Twilight Beasts, this was the largest sloth to have walked the Earth. The enormous creature would have towered above any human, and standing upright on its back legs, it would have easily been able to peer inside the top windows of a double decker bus. Massive, robust leg bones could have held the bulk of this beast as it reared up and fed from higher branches, or even to defend itself against predators, like a foolhardy Smilodon. Skeletal reconstructions generally have Megatherium standing, and rightly so, for this is the best way to show off the impressive size. Illustrations do vary from these sloths grabbing branches whilst standing, to crawling on all fours. Looking at the short legs, although thick and strong, they would have struggled to keep an animal this size upright permanently; if it had to travel for long distances, it is most likely that it travelled on four legs. Interestingly, most of the Megatherium footprints which have been preserved in 10,000 year old mud show this sloth to be walking on its back legs. Perhaps it was easier to walk on two legs than four along the sticky, squelchy, muddy banks? Fossils have been found across South America, from sites in Chile, Brazil, Argentina, and Uruguay. This was one of the first fossils outside of Europe to be described. Eight years after the first specimens were shipped back to Madrid, the great French anatomist, Georges Cuvier, published the first description of this extinct sloth. He correctly assigned the fossils to the sloth Order, Pilosa, and thought its giant claws were used for digging tunnels: Cuvier had created a mole bigger than an elephant! (This actually wasn’t that fanciful. Mammoths thawing out of the permafrost in Siberia were thought by the local people to have been giant burrowing moles, where they used their tusks to dig, and sadly died on exposure to the sun.). Cuvier was right in taking such an interest in the claws. Longer than your forearm, Megatherium claws on it’s hands and feet were immense. Swiping with their giant arms, and very likely causing serious damage, this was a giant not to be messed with. Some researchers suggest they were used to bring down leaves from high branches; beneficial when you are bigger and can stretch further than other herbivores. Their teeth indicate they had quite a varied diet, from leaves and fruits on trees to succulent plants closer to the ground, and these large claws may easily have been used to dig up plant roots and tubers to feed upon. There is a striking similarity between Megatherium‘s claw shape to an animal in the same Order, but with a much more specialised lifestyle. Anteaters have huge claws (resulting in their seemingly odd gait) which they use to rip open termite nests and then use their incredibly long, sticky tongues to feed solely on these nutritious insects. Recent excavations in Southern Brazil show that Cuvier’s original thoughts about a subterranean giant were actually not that far off. Incredible tunnels up to 100m long, and over a meter high have been found which were dug out by Pleistocene sloths! The soft sediment still preserves the claws marks from the creatures who painstakingly dug them out. 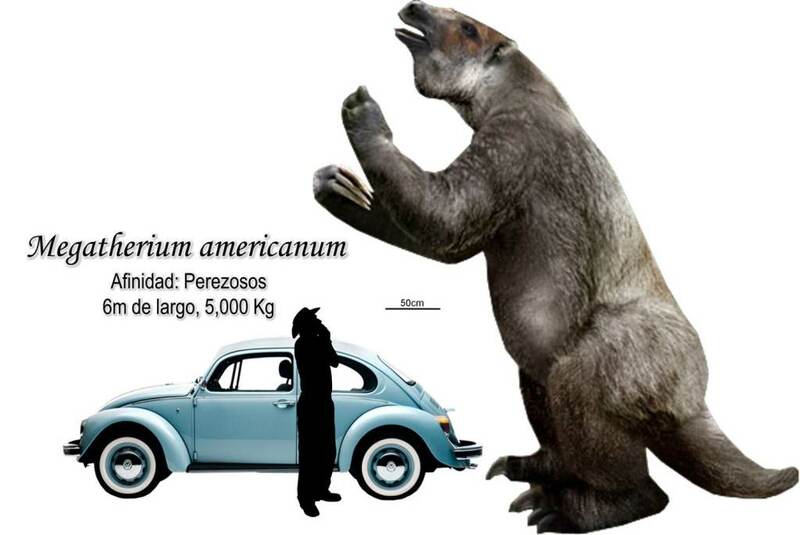 Giant armadillos and ground sloths (possibly including Megatherium) dug into the earth, with their big claws. They clearly did spend some time underground. These palaeoburrows are remarkable evidence of the habits of an extinct creature (click here for a nice image). But the use of these burrows is still unknown. There has been little found inside the burrows to indicate if they were used for hibernating, or living in. A colleague recently suggested the possibility that the males may have patiently dug out these burrows to attract a female. They are very cleanly made, with a lot of effort, and taking a lot of time to move the sediment out of the tunnel. Perhaps Megatherium was the sloth version of the Bower Bird. It is difficult to test this today, but if true, these giants were making their own little tunnel of love! Some researchers have thought that Megatherium could have been a scavenger, using its massive bulk to steal carcasses from other predators. The Giant Ground Sloth would have had no problems scaring away any animal if it chose to scavenge half eaten kills from other predators. There is little real evidence to say the diet was supplemented with fresh flesh, apart from the massive claws. But the claws are not enough. You need sharp teeth to cut the meat and chew it. Megatherium lacked any sharp slicing teeth. The molars were ridged like many herbivores for chomping up vegetation. In fact, this giant lacks the front incisors which are normally used for nipping grass or leaves; instead, there may have been a very long tongue like a giraffe, or big, prehensile lips, similar to a rhinoceros. Although fur has been found preserved in caves for Mylodon, none has yet been found for Megatherium. It is possible the fur was long and shaggy, not too dissimilar to the preserved fur from Mylodon, or the thick long fur of sloths alive today. The gorgeous tree sloth has long thick hair, and is known to harbour green algae, that makes it look green, blending in beautifully with the surrounding forest. There is a hidden world within the fur. It teems with insects, parasites, and fungi. Whatever the colour, or thickness of Megatherium’s fur, this giant was very likely a walking island for dozens of tiny species. Along with the extinction of Megatherium presumably most of these tiny animals who called it home vanished too. It is often strange to think that there are so many species that have existed on our planet that we will never know were there. From trundling around South America for over 2 million years, the great Megatherium vanished fairly recently, around 10,000 years ago. Towards the end of the Pleistocene, the climate was changing, which had an effect on so many of the Twilight Beasts. From the warm temperate, arid to semi-arid environments the Giant Ground Sloth was at home in, the environment changed to cooler and drier with more grasses. For the ginormous browsing herbivore, the changing landscape was a big problem. On top of their shrinking natural habitat, a new creature was on the scene; Homo sapiens. In Argentina, the sites of Arroyo Seco and Paso Otero have revealed Megatharium americanum bones, alongside human artifacts. No cut marks have been found on the bones yet. But, with spears and other projectiles, humans could have easily, and safely, attacked this giant. Large mammals will often have large gestation periods. Elephants, for example, carry their baby for around 2 years; for a mouse, it is around 20 days. With Megatherium under stress from a changing environment, and additional pressures from being hunted, their long gestation time would not have allowed them to increase their numbers quickly enough. Bones of Megatherium were sought after by the Victorians. Along with Mammoth, the Giant Ground Sloth was a creature to behold and admire. Soon, the great dinosaurs stole the lime light, pushing the Giant Ground Sloth back into obscurity. Whilst walking past the magnificent skeleton at the Natural History Museum, more than a dozen times I have heard children, and adults, excitedly, but rather sadly, exclaim, ‘Wow! Look at this dinosaur!’ Megatherium americanum is a beast dear to my heart, and needs no title of ‘dinosaur’ to beef it up. This entry was posted in Giant Ground Sloth and tagged Georges Cuvier, Giant Ground Sloth, London, Mammoth, Megatherium americanum, Natural History Museum, Pilosa, Sloth, Smilodon. Bookmark the permalink. 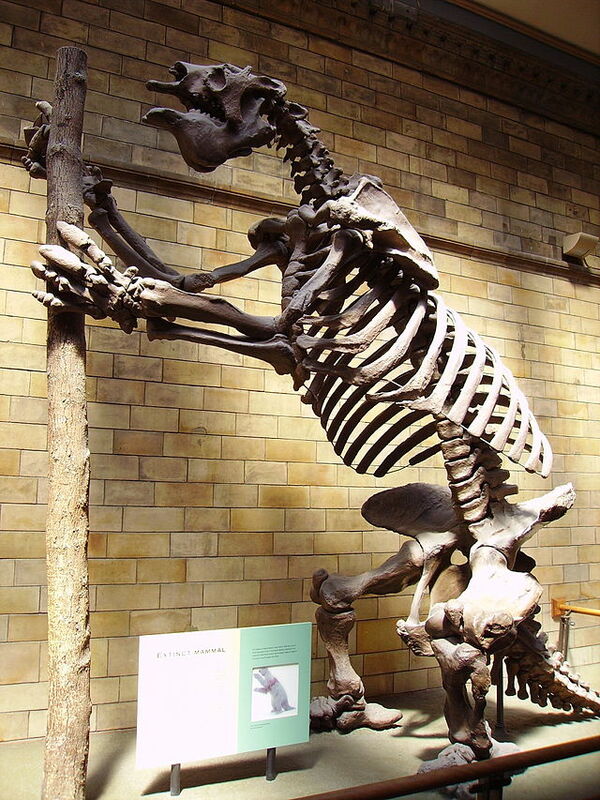 I haven’t thought about the Megatherium at the Natural History Museum since my children grew up, but I do remember thinking that it had something forlorn about it. Large animals alone often do, don’t they? I think we clothe bones when we look at them, and we clothed the Megatherium in a large bear type body and shaggy hair. We imagined it slowly galumphing about without getting in anything’s way or causing any trouble. It’s sad to think of it being hunted – though I know that’s foolish anthropomorphic sentimentality on my part and I would have been out there with my spear, along with everyone else. Nice post! All the family of giant ground sloths is fascinating in many aspects, and Megatherium above all! Regarding the tunnels, I can add that they are much more common than previously thought. 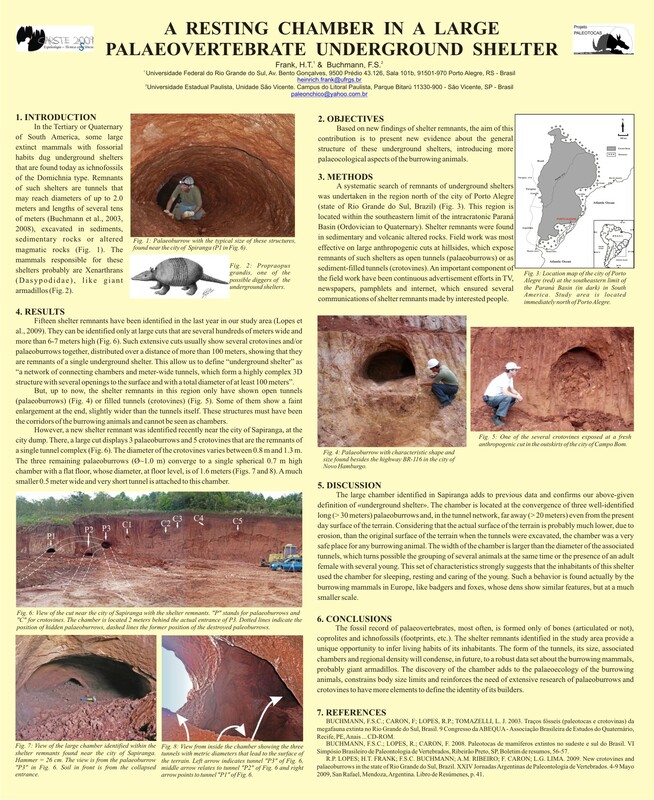 In the region of Argentina where I live, paleontologists were able to identify different morphologies in the tunnels, presuming that various burrowing species could live in the same area. Even if one tunes the eye is able to find traces of tunnels in most of the sites where Pleistocene layers are exposed.